Yet the Gunners are thought to have little money to play with, partly due to their high wage bill, meaning a loan deal could be on the cards. Asked directly whether Suarez might even be with the side in time for their FA Cup fourth-round match against old foes Manchester United on Jan. 25, Emery said only that he would be glad if a player could reinforce the squad. “I know it’s a difficult window for the transfer market and if a player is coming to help us I am happy. But the club is doing that and I am going to wait,” he said. For his part, Suarez will only have fuelled speculation about a move to London by giving a “like” on Instagram to a post about Arsenal’s win over Chelsea. Barcelona have left the player out of their 24-man squad ahead of Sunday’s La Liga match against Leganes. The main aim for Arsenal remains qualifying for the Champions League, which they have now missed out on for two seasons. 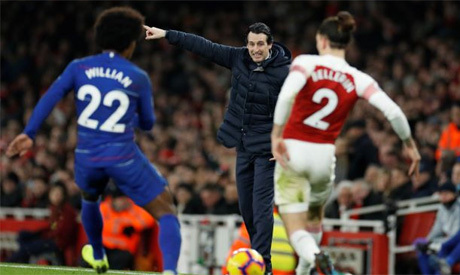 A week ago Emery said the side’s inconsistency had dealt a blow to their hopes of a top-four finish in the Premier League which would qualify them for Europe’s top club competition, following a 1-0 defeat at West Ham United.